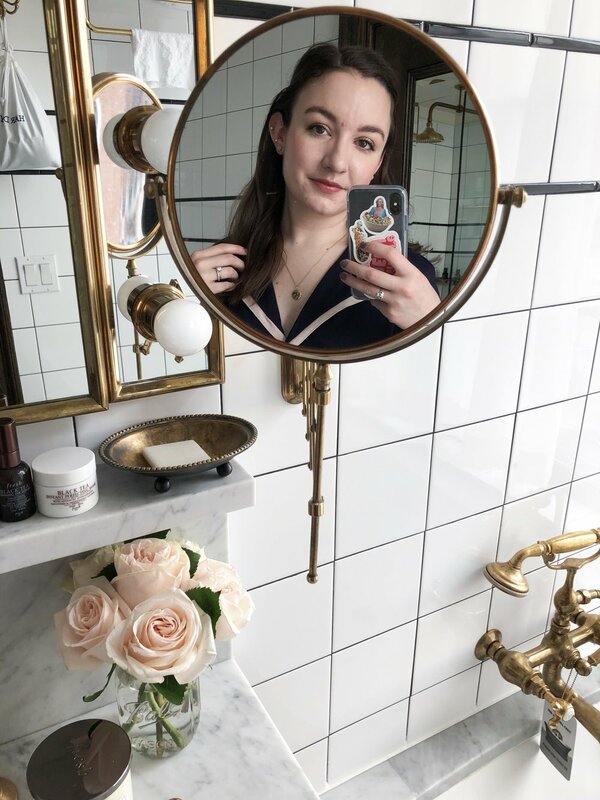 Over the past few months, I've been much better at sticking to a solid skincare routine than I have been in the past, but that doesn't mean I wasn't experimenting with some new products here and there. There's been a mix of new releases and old staples that have all earned a place in my rotation. Glossier Invisible Shield* | (20% off here) The new launch I was most excited about this month was Glossier's new sunscreen. I have a full review on it here, but long story short, I'm in love with it. It's truly the first sunscreen I've been able to wear every day - I know I should have been wearing sunscreen every day, but I just wasn't. Things would pill under my makeup, make me greasy, and make my already pale skin look ghostly and blue. Glossier's doesn't do any of that for me - it feels like nothing on the skin, which is just what I was looking for. I've been using it every day for two weeks now, and the breakouts I had previously that are now healing seem to be leaving less of a mark than usual. Usually any blemish would leave a dark purple mark on my skin for a month or two, but my current breakouts are fading to a pale red mark that's much easier to cover. I really think it's down to wearing sunscreen every day. Farmacy Green Clean Cleansing Balm | So far, Farmacy can do no wrong in my eyes. When I got a sample of the Green Clean from Sephora recently, I used it once and immediately went online and ordered the full size. It smells so fresh and clean, but the scent doesn't irritate my skin or my eyes. It melts down into a luxurious-feeling oil that melts away all of my makeup and leaves my skin feeling super clean, but not stripped. This may have surpassed the Clinique Take the Day Off Cleansing Balm as my favorite. Thayers Witch Hazel Toners* | These are such a cult favorite and have shown up in multiple Top Shelves on Into The Gloss, so I jumped at the chance to try them when the brand reached out to me a couple months ago. I was sent two alcohol-free toners in the Rose Petal and Lavender scents as well as a Body Bar in the Rose Petal scent. So far I've only tried the Rose Petal toner, and it's so refreshing and really wakes my skin up in the morning. I'm contemplating getting a little spray bottle to decant some into to spritz at work around that 2pm slump. I've smelled the Lavender one and it smells incredible, so I can't wait to try that one, too. Anese Can I Speak To Your Manager? Toner* & Slay Serum* | I got another super generous package from the babes at Anese containing two of their newer products. The toner smells amazing and feels so nice spritzed onto the skin. I'm really getting back into using face mists, and Can I Speak To Your Manager is a definite new favorite. The Slay Serum is a lightweight milky lotion that feels super hydrating and nourishing on the skin. It really firms the skin as well, so it's a favorite to use in the mornings to help prep my skin for makeup. This gives my skin a serious glow without being greasy, and I love it. Paula's Choice Resist Omega+ Complex Serum* | Speaking of serum, when I haven't been using the Anese one, I've been trying out this new beauty from Paula's Choice. I've never actually tried anything from Paula's Choice before, but I'm so impressed with this serum. It's a thin, creamy texture that spreads evenly over the skin and sinks right in. It feels really nourishing, and as the name suggests, it uses omega 3, 6, and 9 oils to replenish and revive the skin. This has been my serum of choice at night, and by morning I wake up to smooth, hydrated skin. J. One Jelly Pack | I had heard loads of mixed reviews on this cult-favorite Korean Beauty product. People either seemed to swear by it and love it, or they absolutely hated it. It's meant to be an all-in-one product that hydrates and primes the skin. Since my skin tends to be on the dry side, I've still been doing my normal skincare routine and using this after my moisturizer as a primer. It's said to be a "makeup-gripper," which really piqued my interest. The complaints people had were always with its consistency - it's incredibly tacky when first applied. If patted into the skin rather than rubbed, the tacky sensation goes away instantly, and it really gets to work plumping and lifting the skin. Seriously, this is good, post-facial skin in a bottle. It really does grip makeup as well - makeup still applied easily over it, but I noticed it lasted so much longer throughout the day. I'm definitely on the "love it, swear by it" side of this product. Skinfood Egg White Pore Hot Steam Pack* & Cool Meringue Pack* | These new releases from Skinfood are exclusives to Ulta, and they're meant to really deep clean your pores and get rid of blackheads. They both have similar results - skin is left super clean (but not dry), pores are smaller, and blackheads are diminished. The Hot Steam Pack is a thick, creamy consistency that heats up on contact with the skin and feels super relaxing. The Cool Meringue Pack is a mousse that spreads easily over the skin and definitely feels cooling and quite soothing. As my skin is freaking out at the moment I prefer the Hot Steam Pack, but I feel like I'm going to like the Cool Meringue Pack for general skin maintenance once it clears up. What new skincare products have you been trying lately? And if you want some more mini reviews, check out my girl Amelia's blog - she just did a skincare on trial post, too! *Products mentioned have been sent to me for consideration, but all opinions and results are my own. Please see my disclaimer for more information.